The flow is the balance. She, a runner of life, knows flow is the balance. Running through early morning golden meadows, hair streaming behind, her breathing is deep and even. Her essence is air, the flow is balanced. A runner’s secret, balance can create speed but speed is cause not effect. 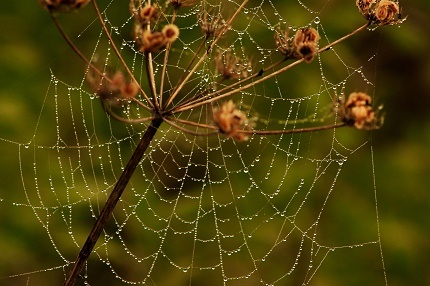 On this morning the soles of her feet fleetingly touch upon damp morning dew on a spider web. Something occurs, an otherworldly melding of effect with cause. Balance is cause but time is effect. She runs on with balance changed. She is fleeter, running more swiftly, the blending of the web’s moisture and air melting elements together. Magic? She finds she can now run through time. Her yesterdays, todays and tomorrows – an all-time effect! The flow is the balance. The effect, the melding of time. Now she runs through life, her life and all life. An amazing thing. An illusion? She runs on. The balance is the flow – time the illusion. Also you can use any theme I’ve chosen and write your own haibun, just let me know when it’s published and I’ll be happy to link it here at the Haven of Haibun. Stay balanced, in harmony with yourself, life and nature. Penny, why do you feel that time is an illusion? I see. Thanks, Penny, to clarify it is a sensation.